Zoee was adopted in 2015 by Pete and Chris. Chris says “She is doing awesome. She has come a long way. She now weighs 10 lbs. (since beg. of May). She has even warmed up to “Daddy”. She doesn’t startle quite as quickly anymore although I don’t think she’ll ever like the big bendy-busses or keys. 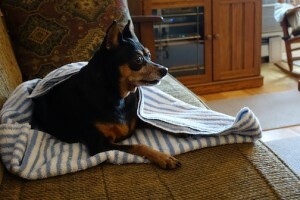 She loves to visit Nanny and Poppa and makes herself comfy on their sofa with her blankies. She loves car rides. Once in a while I’ll take her up to the senior’s residence to visit and she doesn’t mind too much. Of course the seniors all love her and think she’s so cute. She sleeps in bed with us the whole night through. She even enjoys her crate which sits in the dining room and will sometimes go in by herself when I’m working in there. I bought her a really good “Chilly Dogs” winter coat which keeps her nice and cozy and she’ll go for a 30-40 minute walk without any complaints. She is very close/attached to me and sits or lays down beside me whenever I’m on the sofa, which is often, throughout the day. Whenever I come home she does this major “happy dance” and goes flying over onto the sofa (as if she’s trying to say ‘okay Mom, park yourself for awhile’ – ha, ha). Oh my God Lou, she’s just too cute and soooo precious. Even my husband loves her to bits! We are so thankful and blessed to have her. I can’t thank you, Ruth and Minpinerie enough for all you’ve done to bring Zoee into our lives.” What a cute face!